← Can This Be Said of Me? I am looking at my little pine tree. I captured this treasure from the wooded area of my friends’ farm in the days following his premature death. I wanted something living to protect the memories of our precious times together. 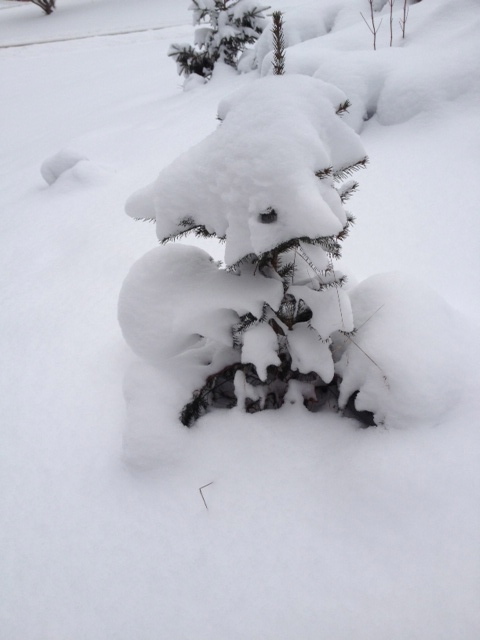 Today the little tree is bearing the weight of heavy snow. It’s posture is determined by its encasement in ice. I need to make time my friend; wait for the sun to shine, the temperatures to warm and then let the little tree stretch its own branches. Maybe you feel like this tree today when everyone else is celebrating. Maybe this tree looks like one of your loved ones. Maybe everything in you wants your spouse back, your broken relationship healed, or your health restored. I listened to a message yesterday entitled. “Nothing Just Happens” by T. D. Jakes. The whole message is “nothing just happens.” We are in a bigger story; God’s story. I invite you to join me today in making time our friend. This entry was posted in Thoughts and Reflections and tagged feelings, friend, snow, time, winter. Bookmark the permalink.